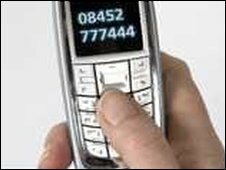 Shoppers in a north Devon town are being offered the opportunity to receive text messages from the police on their mobile phones. The Devon and Cornwall force is testing Bluetooth as a means of communicating non-urgent information. The Bluetooth, short-range wireless devices, will be used in the Forches area of Barnstaple, for the trial. The aim is to improve services and also reduce the amount of non-emergency calls to the 999 emergency number. The devices will initially be located in Forches Costcutter and the local post office, before being rolled out to other locations in Barnstaple. Shoppers have been asked to turn their Bluetooth receivers on, so they can receive a message promoting the force's non-emergency number 08452 777 444 and the police website. These can then be used to contact police to find out who the local officer is or report a non-urgent crime. Pc Andy Wills said: "We are constantly looking at ways to improve our services. "From this pilot we will be able to ascertain just how many people delete or store the message and if it is successful will look for wider adoption across north Devon." The possibilities for the type of information police could exchange with the public through Bluetooth technology were "huge" and included information appeals and promoting community events, Pc Wills added.